Many times we solder zinc 1/4" outer bar onto a window as a framework to strengthen it. 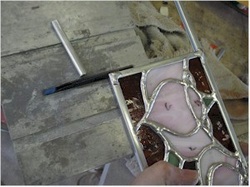 Raw glass panels are usually very weak but adding zinc really increases their strength. To do this, I like to take two pieces of zinc which are longer than the panel and nail them in place so that the glass is locked between the channel of the two pieces..
Then it is easy to lay two other pieces across the edges that are not yet enclosed in outer bar. I can then mark them where they need to be cut. We use a Jarmac saw in our studio to cut zinc. It's preferable to a hack saw. We took it to a machinist to replace the aluminum parts for brass parts that work better. I nail these pieces in place and then tap the ends of the zinc that overlap the edge so they will be lined up to the edge. This way, I only have to cut off the overlapping pieces on one end. I solder the outer bar at each corner and bring all interior lines to the edge of the zinc. Then I cut off the extra zinc, using the saw blade as a "guide" to keep the window lined up with the edge of the panel. 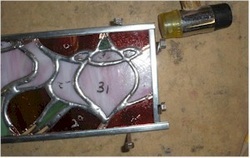 The window is now ready to have rings soldered to the framework or to be installed in another manner. In following your instructions, if I'm correct, you will be left with a small area at each corner (side view) where the glass is exposed. At times I overcome this by mitering the corners but that can be tiresome. When I've used your method, I've put a bit of copper foil on the corners prior to applying the edging and then I can fill in the "hole' with solder. Is this the proper way to do this or is there a better way to handle it? What I do is solder the holes closed. I don't find that I need to seal it with copper foil, I just hit the hole with an iron tip that has a bit of solder on it. The quick pass builds a bridge of solder that I can come back and seal with a bit more buildup after it cools.